Duane: The Boks’ wasted heavyweight? Johannesburg - As someone once said, it’s amazing what a difference a year makes. This time last year, Toulon eighthman Duane Vermeulen wanted nothing to do with a Springbok side down on its luck, saying: “I want to be part of the Boks, but the way things are going now, I can’t see a positive outcome. I still want to play and represent the Boks with all I have. But, at the moment, I can’t see why players would commit 100%. That’s a huge problem". 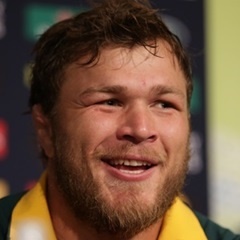 While the man formerly known as Thor – I say formerly because he hasn’t played like Thor since that win over the All Blacks in 2014 – was committing to raking in the euros in the south of France, Warren Whiteley was rolling up his sleeves to help the Boks during their worst season in memory. “I’m in it for the long run. The results might not go our way, but if we stay consistent in what we want to achieve, it will come,” promised Whiteley before being promoted to Bok captain this season. While results of played nine, won five, lost two and drawn two (before Sunday's end-of-year tour opener against Ireland) this year don’t quite represent a complete turnaround, but it’s a damn sight better than last year’s played 12, lost eight and won four. So, in a way, it’s hardly surprising that Vermeulen crept out of the woodwork a few days ago to say he’s ready to play for the Boks again. It was a declaration that was welcomed as much as it was frowned upon by those who follow rugby in these parts, with many suddenly wondering out loud why he wasn’t in Ireland on Saturday. While admitting he was not quite at his destructive best after two games for Toulon, Vermeulen – who tried to underline his desperation with the old “I’ll play tight head if I have to” cliché – said he felt he could add value to a back row missing the injured Whiteley, Jaco Kriel and Jean-Luc du Preez. On the face of it, that’s true – ability wise, Vermeulen, who’s bigger, stronger and has more dog in him than any No 8 in this country, is still the best eighthman South Africa has. But it’s a different Bok team he’d like to come back into. It’s a Bok team that prides itself on a high work rate, something no South African player has picked up after signing up for a French club. Also, should the Boks be investing in an injury-prone 31-year-old for the 2019 World Cup? Vermeulen can’t have played 20 games since his heroics against the All Blacks in 2014. More importantly, Vermeulen doesn’t seem to anticipate paying for what amounted to a dereliction of duty for a senior Springbok last year. When the team was crying out for leaders, he chose to sit it out until the stars were aligned (almost, anyway) before making his return in less choppy waters. He left the responsibility with the likes of Whiteley, Adriaan Strauss and relative babes in arms Eben Etzebeth and Siya Kolisi. If it rankles me as a rank outsider, how much will it aggravate the guys who stayed in the fight to turn things around? I’m told Strauss irritably told the media “at least I’m here” at one point last year. And to think they thought of making him captain at one stage. Vermeulen should be lauded for being honest about why he wants back in – getting his 50 caps as a Bok, having the opportunity to measure himself against the likes of England’s Billy Vunipola and All Black captain Kieran Read again, and hopefully making the trip to Japan in 2019. It might be harsh to point this out, but when you sign for (Toulon owner) Mourad Boudjellal’s millions, it sometimes means you agree to forgo international milestones, and miss out on enjoying elite rivalries and chances to win the World Cup. Hoping for better than that is wanting your bread buttered on both sides, which is not such a good look for someone who’s made their tick in the age-old question of money or the Boks. It’ll be tough for Vermeulen to stand in the back of the queue with inferior players, but, just by manning the fort, they’ve earned it more than he has.